Whew…pardon my absence…it has been a hectic last couple of weeks. I have managed to get the January schedule up, so classes are posted. Changing a few things up, so check it out! I did miss Diva #247, but I will go back and make it up this week, like I usually do. I started on #167, and have not missed one, but they have occasionally been late. I did, however, kill two birds this week with Diva #248. I needed a gift for my brother and sister-in-law, and they really don’t want anything, so I made them a cool dreamcatcher. I am framing it tonite, and will have it in the mail on Tuesday. 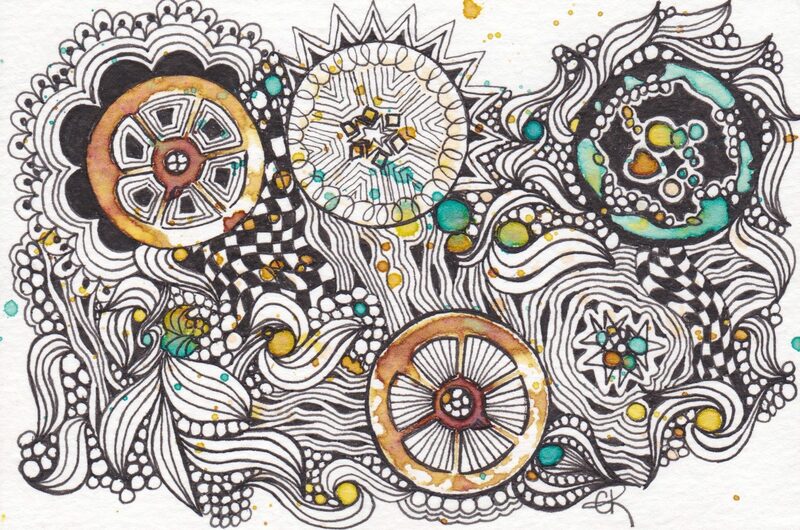 Better late than never, the Gift of Zentangle! It is about 8 x 10, on Charcoal paper. Microns, Silver Gelly Roll, and Prismacolor Premier Pencils. I have not been completely slacking this past 2 weeks. I did this neat mandala in my purse journal at church, week before last. It is a lot smaller than it looks…my journal is a 4 x 6. Oh, and last but not least, I hosted the San Diego/Temecula Zentangle Friendship Group at the shop for our December meeting. Pot luck, gift exchange (all tangly! ), and we did Dorian Eng’s pretty ornament. Between the shop and classes and the holiday season, I’ve been a bit wiped out. We’ve had our first Christmas party/celebration with the kids coming out from Texas, and getting together with friends and family for a nice meal and spending time with our grandson. This year, he is all about Batman. So Batman it was! And now, off to finish my framing, and draft the samples for upcoming classes! I wondered at first why you would frame what I thought was a mixed media piece that should dangle somewhere…Then I realized that wasn’t a real metal frame and thread, but drawn! Very nice! And obviously very 3D appearing! Nicely done! You have been very busy! The dream catcher is wonderful. I love Opus. Mine has the bath towel and shower cap. Your grandson looks like a very nice guy!!! I love the dream catcher. Beautiful work!!! I wish you a very Merry Christmas & a Happy New Year!